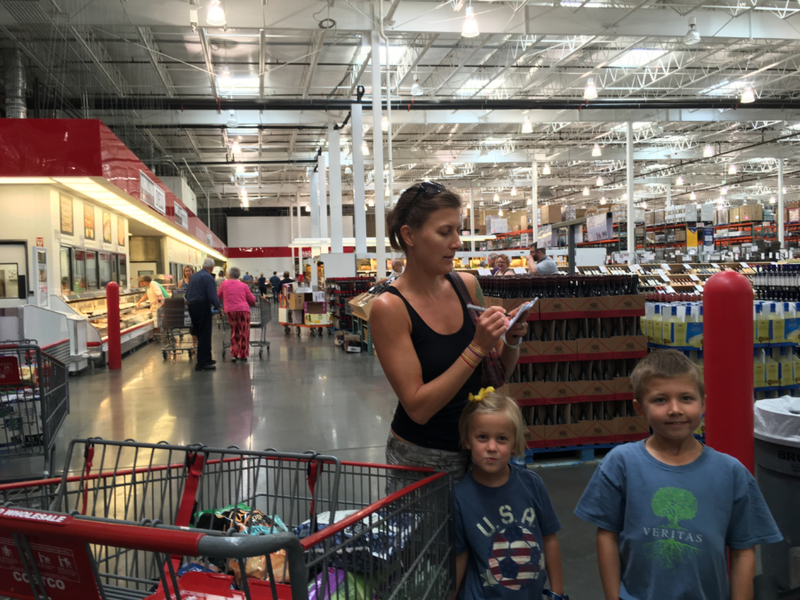 Squeezing Things in Shops — Ginger writes. "And there were other everyday things to occupy her time and her mind, including the shopping. Men might believe that food appeared miraculously in the kitchen, but women...knew better than that. They could hardly forget that there was a lot of trudging around shops to be done, and the choosing of this item rather than that one, which sometimes involved squeezing things to determine ripeness, or sniffing them to gauge freshness. This, she had noticed, was not something that men tended to do; they did not squeeze things in shops." I do my fair share of trudging around shops. All during the school year last year, I paid for childcare so as not to take my children grocery shopping each week. I was paying money to save money, and it was good. But this summer, I felt it was best practices as a mom to have the kids learn about, and participate in, what is a non-avoidable part of being human. Somebody has to squeeze things in shops. We have a little system of sorts at this point, and everyone is part of the team. Bauer pushes the cart and picks things off the shelves as needed. I send him here and there to find things on the list while I find other things. He gets the rotisserie chicken while I get the bell peppers. He looks for popsicles while I look for Udi's bread. I use the Sharpie from my purse to mark off chicken-peppers-popsicles-bread. Cash and Story are grocery buddies, alternating between lively (good) and rowdy (bad). If there's a little cart, Story pushes it. Story asks for a sample, and Cash wants one too. Sailor rides in the stroller, or walks, or cries when she doesn't get to choose. She eats Cheerios or plays with produce bags or holds my Costco card the whole trip. Bauer watches Sailor while I go to the bathroom with Cash and Story. 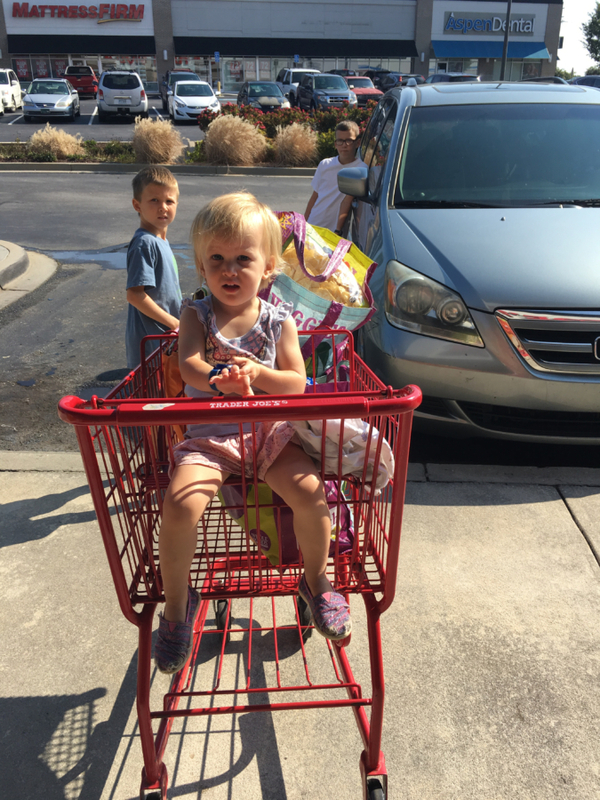 Story puts her little cart back at Trader Joe's, and Cash gives his stickers to Sailor. I pay, and I try to pay attention. Bauer loads the groceries into the van while I get Sailor buckled back in her carseat. Everyone wipes their own hands. I give them gum for good behavior and we practice our Bible verses and listen to music on the way home. And then at home, the putting away begins. Bauer is central to these efforts, an indispensable part of our grocery store rhythm. He carries the watermelons, puts away the cooler and ice packs, and loves to organize and arrange the groceries into our two pantry spaces. Cash makes a small trip or two from the van, and then is dismissed to play with Sailor and keep her out of the kitchen. At this point, I'm just thankful if Story gets her hands washed and her shoes put where they go. She disappears into her room, happy to be home. I am happy we did it together, and happy that I now get a whole week off from all that. I'm happy we have money to buy not only our groceries but enough food to invite people over, too. I am happy to give my kids a form of work, the chore of trudging around shops if that is what it takes. I am happy we have a baby to bring along, even if it takes longer. I am happy for a strong and capable ten-year old boy, and the two playful, cheerful middle ones. I am happy for music and A/C in the van. I am happy for loads of South Carolina sunshine and very few rainy shopping days. I am happy for life itself, for food to sustain us, for so many choices, and for writers like Alexander McCall Smith who encourage me in the ordinariness of my daily routine. I say Yes to "squeezing things to determine ripeness, or sniffing them to gauge freshness." Elsewhere, AMS says "people took babies everywhere, and babies seemed to be happy enough with such arrangements." Because he puts into words what I am already living, it is a reminder to say Yes to Sailor's presence on our grocery days, and to speak a resounding Yes to this good, good life.